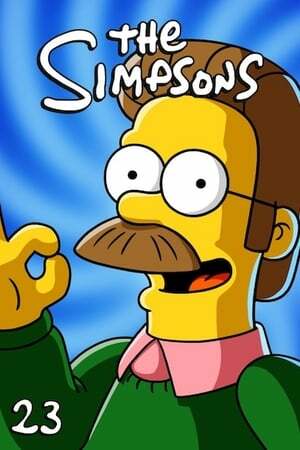 The Simpsons' twenty-third season began airing on Fox on September 25, 2011 and ended on May 20, 2012. The show's 500th episode, "At Long Last Leave", aired on February 19, 2012. Homer befriends Wayne, a reserved security guard recently hired by the nuclear power plant. Plagued by violent flashbacks from his past as a CIA agent, he must overcome his tortured nightmares to save Homer from a Ukranian terrorist. Meanwhile, Marge fantasizes about being a contestant on "Top Chef" hosted by Tom Colicchio, and the future of Springfield's hottest "it" couple Nedna, Edna Krabappel and Ned Flanders, will be revealed after months of online fan voting and speculation. 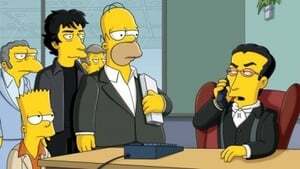 Superintendent Chalmers reveals his hero as former President Theodore Roosevelt, who makes an appearance in the episode with the use of archival recordings. 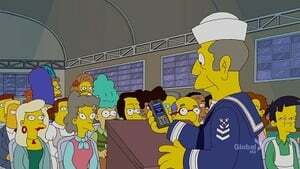 Simpsons' twentysecond Halloween show. The Diving Bell and the Butterball: Homer is bitten by a radioactive spider. 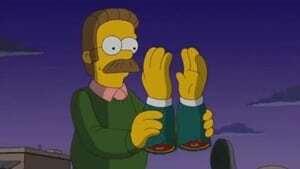 Dial "D" for Diddly: Ned becomes a serial killer. 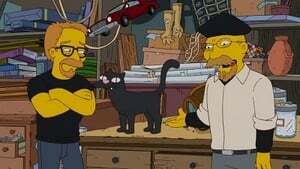 In the Na'Vi: Bart and Milhouse in an Avatar spoof. Bart’s science fair project, a mechanical baby seal, outshines Lisa’s brainy asteroid model and quickly becomes a popular pet among the retirement home patrons. Meanwhile, Homer’s new and eager assistant Roz, steals Homer’s job, forcing him to team up with Flanders to reveal her true colors and evil past. Lisa becomes disheartened when she learns the shocking truth behind the “tween lit” industry and her beloved fantasy novel characters, but Homer decides to cash in on the craze and forms a team to group-write the next “tween lit” hit, with the king of fantasy, Neil Gaiman, lending his expertise to the effort. The Simpsons host a tastemaker party at their home to promote Absolut Krusty, Krusty the Clown's own brand of liquor. Mr. Burns takes notice of the party's success and decides to promote Homer to "Account Man" for the Springfield Nuclear Plant. 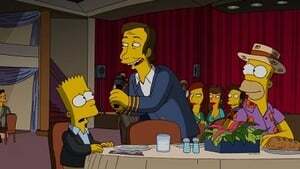 "The Ten-Per-Cent Solution" is the eighth episode of the twenty-third season of the American animated sitcom The Simpsons. It originally aired on the Fox network in the United States on December 4, 2011. In the episode, Krusty the Clown becomes depressed after getting fired from his television show for being unpopular with children. 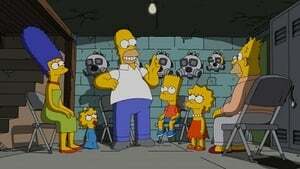 The Simpson family encourages him to make a comeback, suggesting that he seek help from an agent they met earlier at a television museum. This agent turns out to be Annie Dubinsky, who was Krusty's first agent and former girlfriend. Krusty left her when he became successful but now he begs her to take him as a client again. She accepts and together they are able to get him back on television, hosting a show for adults that features his clown tricks. However, Annie soon begins to interfere too much, which frustrates the network executives. The episode, which contains parodies of films such as The King's Speech, The Social Network, and Black Swan, was written by cast member Dan Castellaneta and his wife Deb Lacusta. 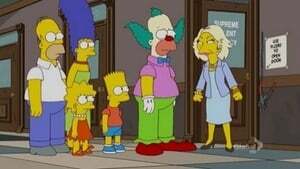 Comedian and actress Joan Rivers, who is a big fan of The Simpsons, guest starred as the character Annie. 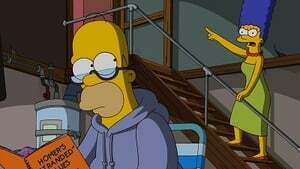 Other guest performances in the episode came from Kevin Dillon and Janeane Garofalo as themselves and Jackie Mason as Krusty's father. Reception of "The Ten-Per-Cent Solution" from television critics has been mixed, with praise directed at Rivers' appearance and the development of Krusty's character. 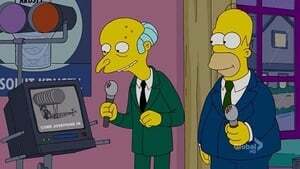 The episode was criticized by the Parents Television Council for containing sexual dialogue. During its original American broadcast, the episode was seen by approximately nine million people. 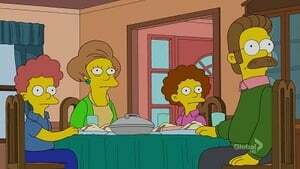 In this futuristic holiday episode, Bart is a deadbeat dad living in Springfield Elementary (which is now an apartment complex instead of a school) with Principal Skinner as his landlord. Meanwhile, a pregnant Maggie goes into labor during a family dinner. 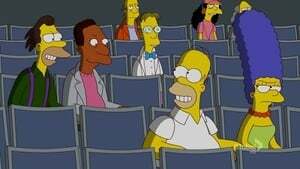 Homer lands his own political talk show and becomes the spokesperson for the Gravy Movement. He then is asked to select the next Republican nominee for President and officially endorses right-wing rock star Ted Nugent. Lisa creates her own social networking service, SpringFace, and subsequently makes everyone addicted to the internet. Meanwhile, Patty and Selma challenge the Winklevoss twins at the 2012 Summer Olympics. 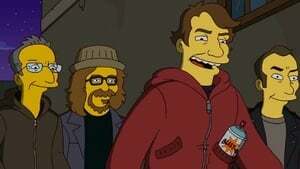 After Moe is heckled for not having any real companions, Moe's best friend and beloved bar rag narrates his incredible thousand-year journey to Springfield. 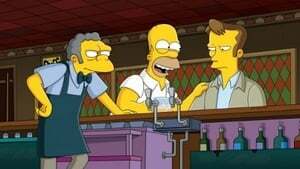 Beginning in the Middle Ages, the bar rag was loomed into a beautiful and ornate medieval tapestry and traveled around the globe through the hands of royalty before finding himself found himself at Moe's Tavern. Meanwhile, Bart begs Milhouse for forgiveness after the two friends get into a tiff, and when the bar rag goes missing, Moe realizes that he has more friends than he thought. Marge and Lisa's mother-daughter Valentine's Day plans take a turn when Lisa meets Nick, an intellectual romantic who shares the same passion for culture, history and literature. Lisa and Nick fall head over heels for each other in a fairytale romance and make a secret getaway to Mulberry Island to profess their eternal love. Meanwhile, Bart and Milhouse are inspired by the hosts of "MythCrackers" to "crack" Springfield Elementary's own legends. 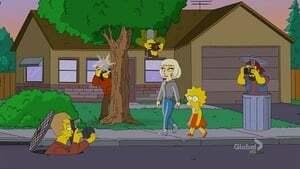 The Simpsons are evicted from Springfield and join an off-the-grid community outside of town. 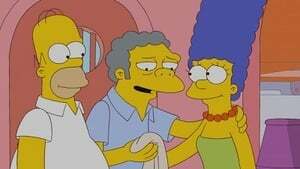 But when Homer and Marge try to sneak back into Springfield, they are welcomed with hostility from their former friends and neighbors and begin to appreciate their new and more accepting home. In order to get back at his dad, Bart goes undercover as a graffiti street artist and plasters Homer's unflattering image all over Springfield. 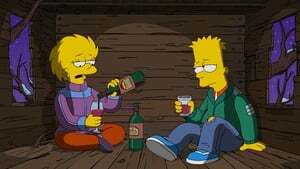 But one night, Bart and Milhouse get caught in the act by established street artists Shepard Fairey, Ron English, Kenny Scharf and Robbie Conal (guest voicing as themselves), and to Bart's surprise, they invite him to exhibit his satirical artwork in his very own gallery show. Meanwhile, a hip, new health food superstore opens in Springfield that threatens to put Apu and the Kwik-E-Mart out of business. Karma gets the best of Homer after he gets his friends in trouble, and as a result, his bedwetting problem worsens. The family goes on a mission to infiltrate his dreams to search for clues in his subconscious to determine the source of his problem. 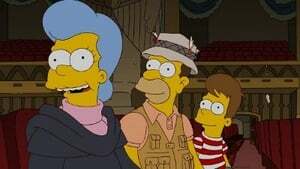 But just as things take a dangerous turn in the dream, a figure from Homer's past appears, and he is finally reassured that the fond memories of his mother Mona (guest voice Glenn Close) remain alive, giving him just the right amount of reassurance to cure him of his problem. Mr. Burns replaces all of Springfield Power Plant's employees with robots (guest voice Brent Spiner) but decides to keep Homer as the sole human worker. With unemployment at an all-time high and mechanical arms operating the workplace, Springfield becomes a dismal and humorless place. 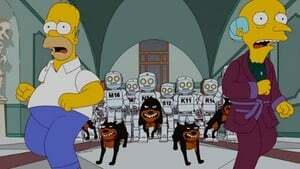 But when Homer's machine-programmed peers start to turn on the community and his former real-life employees come to the rescue, they all realize that robots can't replace human friends. When Bart supervises Jimbo's girlfriend at a movie, she develops a crush on him; Homer is persuaded to buy a state-of-the-art treadmill with a television, and he becomes obsessed with watching it from the treadmill, but not actually working out. When Bart gets his wish for a family vacation, he becomes determined to make it last forever. When word gets out that Edna and Ned have secretly wed, Marge offers to throw them a party, but bringing folks together makes them all realize that no marriage is perfect. Meanwhile, Edna tries to help Ned's children become more socially acceptable. Watch the credits... there's a treat!